Enhance your display with charming wicker baskets. Use as a stand alone display or in conjunction with stands, platforms or grid/slatwall attachments. These baskets create a unique aspect to your design aesthetic and are still functional. 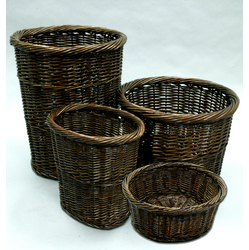 Baskets are available in a variety of sizes and depths.